Phoenix Rising is a powerfully musical and visual DJ performance show with an all female entourage. Breathtaking performances from the most unique and talented performers within Ireland set the stage alight with their dazzling displays of theatrical genius. Fire performers, dancers, international aerial hoop performer, specialist hula hoop performer, champion aerial silks/rope performer and a champion pole performer set a dramatically endearing tone on stage while DJ Artist Zoe, one of Ireland’s leading female DJ’s, drives the intensity of the show bringing the audience on a captivating journey of the most uplifting House music. For the maximum element of surprise, the finale sees Zoe stepping away from the decks to join her dancers on stage for a dynamic dance performance at the last track of her set. To perfectly compliment and enhance the visual experience of the show, Phoenix Rising, in keeping with its all powerful title and abundant talent, adopts a warrior or goddess theme. Dark clad ninja, goddess of war, Egyptian or Greek goddess and native American warrior costumes, heighten this unique and world class act. The performers in the show are incredible; see the champion aerial rope performer fold and propel herself in mesmerising and jaw dropping movements while hanging from the roof on nothing but a length of long rope. Watch the international hula hoop girl spin 6 hula hoops at once on different areas of her body, observe the sassy and sophisticated display of pure warrior strength from the pole performer, while the feisty fire performers intensify the heat with their hypnotic fire dance. As a DJ, Zoe is one of the best in her field at and has definitely earned her spot as one of Ireland’s leading female DJ’s. 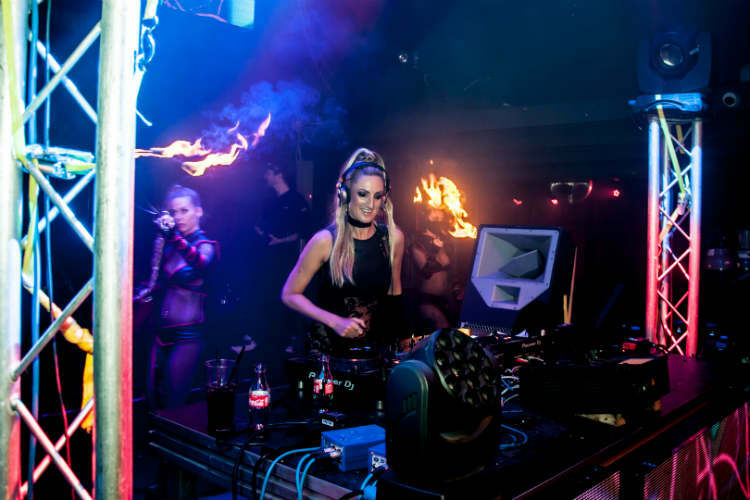 Through her profound love, passion and amazing ability to connect with her crowd, Zoe has conquered dance floors and inspired crowds from the turn of the millennium at events throughout Ireland, the UK and Cyprus (Ayia Napa, Larnaca and Limassol). From the ever popular northern haven, Planet Love, to the electrical atmosphere of Creamfields Ireland (mainstage) and over the waters to a residency for a year at the ever popular Temple, Glasgow. Zoe’s career has also taken her deep into the world of of radio. She broadcasted a weekly radio show, “The Bassline” on top digital dance music station, RTE Pulse (which is within the mainframe of Ireland’s national broadcaster RTE) for a span of 5 years. The Bassline, which was scheduled straight after Roger Sanchez’s ‘Release yourself’ show became one of the station’s most popular and successful shows to date. But Zoe held a massive vision she intended to create, she had always dreamt about performing as a dancer on the stage of her very own DJ set. This girl loves a creative challenge, and so from a thought far beyond the box, her Phoenix Rising’ show was born. ★ Highly innovative, original concept – a top female DJ who performs as a professional dancer and DJ in her own DJ Performance show. ★ Powerful, sassy, sophisticated, highly entertaining, explosive. Phoenix Rising is a truly epic experience. ★ The show is versatile and is perfect for corporate events, festivals and larger club events. It can be tailored to suit the brand and scale of each event.